Today, the Sesquicentennial of American Independence Commemorative Silver Half Dollar Coin remembers when British General Howe marched his troops into Philadelphia on September 26, 1777. Why General Howe abandoned his part of the Hudson River campaign and chose, instead, to capture Philadelphia was a mystery. It remained a mystery for eighty years. Washington was surprised when he learned of the change of plan, and he hastily marched southward to protect Philadelphia. As Howe’s fleet sailed along the coast it was heralded by patriotic signal fires and messengers. General Howe called Philadelphia the “rebel capital.” He was anxious to capture it, but he was afraid to sail up Delaware Bay, so proceeded to march overland from Chesapeake Bay. Washington had been watchful and decided to check the British at Brandywine Creek. The British greatly outnumbered the Americans. Washington lost the battle (September 11 , 1777) and among his wounded was young Lafayette. However, Washington retreated in good order and continued to delay the British. He entered Philadelphia, where the people were anxious for another effort before the city should be given up. Washington marched out for another battle, but a drenching storm wet the powder of both armies and the battle was not fought. Congress moved out of Philadelphia and Howe entered the city in triumph (September 26, 1777). Washington attacked him at Germantown (October 4), but was driven back and then went into winter quarters at Valley Forge. The great value of Washington’s campaign around Philadelphia is best understood when it is remembered that Howe was prevented from finishing the capture of that city early enough to send the needed help to Burgoyne up the Hudson River. General Washington wrote of the battles and challenges. Washington retired to the Yellow Springs, but was not followed by the British; and he finally passed over the Schuylkill at Parker’s Ford. The account of these movements is best related in his own words. “The enemy,” he says, “by a variety of perplexing maneuvers through a country from which I could not derive the least intelligence (being to a man disaffected), contrived to pass the Schuylkill last night at the Fatland and other fords in the neighborhood of it. “They marched immediately towards Philadelphia, and I imagine their advanced parties will be near that city tonight. They had so far got the start before I received certain intelligence that any considerable number had crossed, that I found it in vain to think of overtaking their rear, with troops harassed as ours had been with constant marching since the battle of Brandywine. “When I last re-crossed the Schuylkill, it was with a firm intent of giving the enemy battle wherever I should meet them; and accordingly I advanced as far as the Warren Tavern upon the Lancaster road, near which place the two armies were upon the point of coming to a general engagement, but were prevented by a most violent flood of rain, which continued all the day and following night. “When it held up, we had the mortification to find that our ammunition, which had been completed to forty rounds a man, was entirely ruined; and in that situation we had nothing left for it, but to find out a strong piece of ground, which we could easily maintain till we could get the arms put in order, and a recruit of ammunition. “Before this could be fully effected, the enemy marched from their position near the White Horse Tavern, down the road leading to the Swedes’ Ford. I immediately crossed the Schuylkill above them, and threw myself full in their front, hoping to meet them on their passage, or soon after they had passed the river. “The day before yesterday they were again in motion, and marched rapidly up the road leading towards Reading. This induced me to believe that they had two objects in view; one to get round the right of the army, the other perhaps to detach parties to Reading, where we had considerable quantities of military stores. “To frustrate those intentions, I moved the army up on this side of the river to this place, determined to keep pace with them; but early this morning I received intelligence, that they had crossed the fords below. “Why I did not follow immediately, I have mentioned in the former part of my letter; but the strongest reason against being able to make a forced march is the want of shoes. Congress adjourned first to Lancaster, and then to Yorktown in Pennsylvania, where they continued eight months, till Philadelphia was evacuated by the enemy. Immediately after the British entered the city, Lord Howe went out of the Chesapeake with his fleet and came round into the Delaware, intending to force the strong defenses in that river, and ascend to Philadelphia. To aid in this undertaking a detachment of British troops was stationed on the left bank of the river in New Jersey. The larger part of the army was encamped at Germantown, the remainder being in the city. In this divided state of Sir William Howe’s forces, Washington conceived the plan of attacking him by surprise. The British encampment extended across the village of Germantown, and at right angles with the main road. The American army was near Skippack Creek, about fourteen miles distant. At seven o’clock, in the evening of the 3d of October, the march began, and by the order of battle the troops were to approach the enemy by four routes, it being expected that the whole would arrive nearly at the same time. The divisions of Sullivan and Wayne, flanked by Conway’s brigade, were to enter the town by the road leading to the enemy’s centre; while Armstrong, with the Pennsylvania militia, was to take the road on the right near the Schuylkill, and gain their left and rear. The divisions of Greene and Stephen, flanked by McDougall’s brigade, were to make a circuit on the American left, and attack the British right wing, while the Maryland and Jersey militia, under Smallwood and Forman, were to move down by a road still farther to the left, and fall upon their right flank and rear. The plan was extremely well concerted, and the surprise was complete. The attack commenced between daybreak and sunrise. At first the action was very warm in the centre, and afterwards on the American left, and everything seemed to promise success; but the Americans were ultimately obliged to retreat, and leave the enemy in possession of the ground. Washington speaks of this event as follows, in a letter to his brother. “After the enemy had crossed the Schuylkill, we took the first favorable opportunity of attacking them. This was attempted by a night’s march of fourteen miles to surprise them, which we effectually did, so far as to reach their guards before they had notice of our coming; and, if it had not been for a thick fog, which rendered it so dark at times that we were not able to distinguish friend from foe at the distance of thirty yards, we should, I believe, have made a decisive and glorious day of it. “But Providence designed it otherwise; for, after we had driven the enemy a mile or two, after they were in the utmost confusion and flying before us in most places, after we were upon the point, as it appeared to everybody, of grasping a complete victory, our own troops took fright and fled with precipitation and disorder. “How to account for this, I know not; unless, as I before observed, the fog represented their own friends to them for a reinforcement of the enemy, as we attacked in different quarters at the same time, and were about closing the wings of our army when this happened. “One thing, indeed, contributed not a little to our misfortune, and that was a want of ammunition on the right wing, which began the engagement, and in the course of two hours and forty minutes, which time it lasted, had, many of them, expended the forty rounds, that they took into the field. “After the engagement we removed to a place about twenty miles from the enemy, to collect our forces together, to take care of our wounded, get furnished with necessaries again, and be in a better posture, either for offensive or defensive operations. “We are now advancing towards the enemy again, being at this time within twelve miles of them. “Our loss in the late action was, in killed, wounded, and missing, about one thousand men, but, of the missing, many, I dare say, took advantage of the times, and deserted. “General Nash of North Carolina was wounded, and died two or three days after. Many valuable officers of ours were also wounded, and some killed. 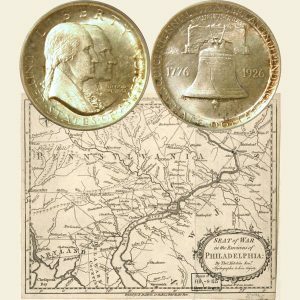 The Sesquicentennial of American Independence Commemorative Silver Half Dollar Coin shows with a map of the seat of war in the environs of Philadelphia, circa 1777.